Wall Street Banks Are Trading in Their Own Company’s Stock: How Is This Legal? Increasingly, under the mantra of liquidity, trading activity on Wall Street that would have resulted in criminal charges in another era is yawned at by regulators. The week that Donald Trump shocked markets around the globe by getting himself elected President of the United States, Wall Street banks like Citigroup, JPMorgan Chase, Bank of America and others traded millions of shares of each other’s stocks – as well as trading millions of shares of their own publicly traded stock. The trades were not directed to a regulated stock exchange like the New York Stock Exchange. Instead, the trades were conducted internally by the Wall Street bank’s own Dark Pool – an entity appropriately named for its darkness and hands-off regulation. According to the FINRA data, for the week of November 7, 2016 (which included the Tuesday Presidential election in the U.S.) Dark Pools traded 158.8 million shares of Bank of America’s stock. That was more than three times the number of shares traded the prior week in Bank of America shares by Dark Pools. Of the 158.8 million shares traded, 1.2 million shares were traded in 6,850 separate trades by an internal Dark Pool at Bank of America’s Merrill Lynch unit called Instinct X. The same week, one of Citigroup’s myriad Dark Pools, Citi Cross, traded 360,924 shares in 2,026 separate trades in its own stock. JPMorgan Chase’s Dark Pool, JPM-X, traded 2.2 million shares of its own publicly traded stock in 5,042 trades the week of November 7. The SEC has given a more benign sounding name to Dark Pools, calling them Alternative Trading Systems or ATS. As if it’s any help to the investing public, the SEC grandly provides a regular listing of the Dark Pools. But as we pointed out in a previous article on Citigroup’s Automated Trading Desk (ATD), the SEC doesn’t seem to have a solid handle on just how big internalized trading is at the mega Wall Street banks. 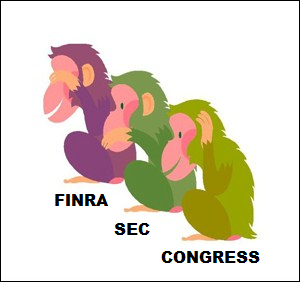 The same big banks that have been charged with cartel activity for joining together to rig the interest rate benchmark Libor and foreign currency rigging, not to mention the rigging of prices on the Nasdaq stock exchange in the 1990s, are now being allowed by the Justice Department and SEC to make Dark Pool trades of their own stock and each other’s stocks. Here’s why this reckless gambit could blow up the street again. One of the key functions of Wall Street is to provide a fair and open venue for price discovery of a company’s stock price. Because Wall Street CEOs have a vested interest in keeping their share price high – in order to keep their job and to get lavish awards of company stock as part of their compensation – internal trading of their own stock is a deeply conflicted and outrageous practice, especially given their prior history of cartel activity. Without proper price discovery, a zombie bank could be taking on major risks only to blow up suddenly. We’re thinking of Citigroup in the last weeks of November 2008 and the Bank of United States in 1930. Franklin D. Roosevelt was sworn in as President on March 4, 1933. Two days later he closed all of the country’s banks until March 13 to stem a full scale banking panic. The spark that had ignited a spiraling panic was the collapse of the Bank of United States three years prior. When Bank of United States collapsed, it was the fourth largest depositor bank in New York City, holding $268 million for over 400,000 small time depositors. It was the largest banking collapse in the nation’s history at that point. The name of the bank suggested it had U.S. government backing. It did not. Media reports of the collapse fueled other bank runs around the country as there was no Federal-deposit insurance in place at that time. Similar to the casino structure of today’s biggest deposit-taking banks on Wall Street, it had a stock trading arm, the Bankus Corp. It was through that trading unit that the bank manipulated the price of its own stock, using the money of depositors, and then used the shares as collateral for loans. Banking examiners later determined that other banks had acted in a similar fashion. Following intensive Senate investigations and hearings, Congress passed the Glass-Steagall Act on June 16, 1933. This Act created Federal Deposit Insurance for bank deposits while also banning banks taking insured deposits from owning stock trading houses. The nation’s financial system was safeguarded under this separation for 66 years until the Bill Clinton administration repealed the Act in 1999 with pressure from Citigroup, his Treasury Secretaries Robert Rubin and Larry Summers, Federal Reserve Chairman, Alan Greenspan, and a deeply misguided New York Times. Following the greatest collapse of our financial system since the Great Depression and the biggest taxpayer bailout of Wall Street in history, one would have expected meaningful reform. Instead, the dangerous practices of Wall Street have actually grown in magnitude. Increasingly, it feels like another crash is inevitable given the lack of resolve by Congress, this President and his immediate predecessor.